Devil's Hole, Ash Meadows National Wildlife Refuge, Nevada. Cave, rock shelter fractures, or sinkholes where unconfined aquifer is exposed near the land surface. Sketch of Exposure spring type. 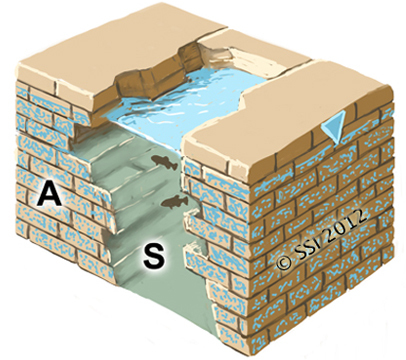 A=aquifer; S=spring source. Fault lines are shown where appropriate. The inverted triangle represents the water table or piezometric surface. Features where groundwater is exposed at the surface, but does not emerge. Typically these types of springs occur at sinkholes (Waltham and Fookes 2003) but can also form in areas where there are any vertical conduits into an aquifer. Devil's Hole in Ash Meadows National Wildlife Refuge, Nevada, is a well-known example of an exposure spring. The unique microhabitats of this site, along with its isolation support the endemic Ash Meadows riffle beetle (Elmidae: Stenelmis calida) and Devils Hole pupfish (Cyprinodontidae: Cyprinodon diabolis; Deacon and Williams 1991; Schmude 1999). Concern about the pupfish has resulted in special legal and management protection of the associated aquifer, as well as the site.